Here are the best dog foods you can buy for dogs of every age and stage. When you make the momentous choice to become a dog mom, you want to pick the very best dog products so you can spoil your pup right. As you check items off your list of dog essentials — like a cozy dog bed, a stylish dog house, a secure crate, and doggy meds — you can't forget quality dog food for your fur baby. It might just be the most important choice you make as a pet parent. Your dog is your best friend, and you want them to eat well so they stay healthy and strong. Unfortunately, with all the conflicting information out there about what makes a dog food nutritious and safe, it can be hard to choose the right food for your dog. There are so many questions to consider: Does expensive mean better, or are healthy, delicious pet food options available for those of us on a budget? Are certain pet food ingredients actually bad for your dog, or are special dog foods just a lot of hype? Do you really need to choose your dog's food with their age or breed in mind? There’s also the matter of taste. Not only do you want your dog to enjoy their meals, but you want their food to taste good so they actually eat it instead of spilling it all over the kitchen floor. If you’re looking for the best of the best when it comes to feeding your dog, look no further. I've compiled the best dog food options available at a variety of price points (including dog food for playful puppies, active adults, and more chill seniors), and even foods for pets with dietary restrictions and food allergies (yes, dogs can have allergies, too). From dry kibble and puppy chow, meaty wet dog food, and even foods for pets with special needs, there’s a dog food available for every age, stage, and palette. So if you need help sorting through the options to find the best dog food available for your pooch in 2019, bookmark this page so you have all the info in one place. Happy shopping! The dog food voted the "best of the best" by Amazon Verified Expert BestReviews is Ziwi Peak Air-Dried Dog Food Recipe. This animal protein-based dry dog food boasts ethically-sourced lamb, beef, chicken, venison, and mackerel, and a unique air-drying process that protects nutrients and preserves the food so it lasts longer than raw dog food options. Made from 98 percent meat, organs, bones, and mussels, this food is grain, and soy free, and claims to require less food to satisfy your pooch than dry or raw dog foods. With a respectable 4.4 out of five stars and over 750 reviews on Amazon, it might be worth the high price tag of $20.26 for one pound to $130.11 for 8.8 pounds of food. As one five-star reviewer notes, "It's been over a month now, my Dog looks forward to feeding time, devours the food and leaves nothing behind. Stool volume is way down, no more fillers or things that are only detrimental, just like nature intended. Also noticed a huge improvement in the breath department, along with no issues with poop time or loose stools. Skin is improving, nibbling and paw chewing is declining. All the noted benefits of the food is coming into fruition and I hope it continues. 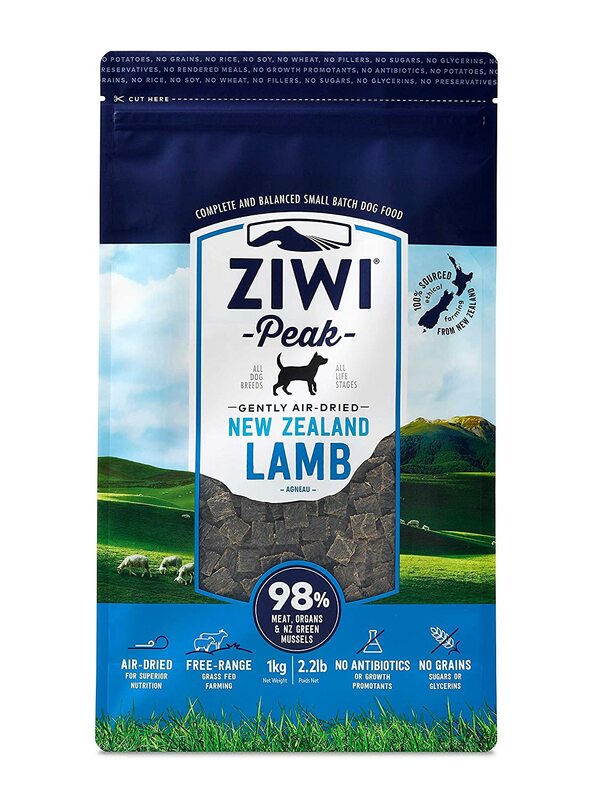 My Dog loves Ziwi Peak and also the Ziwi Peak treats. The cost is high, but when you weigh out the positives and vet visits you may avoid due to feeding it along with having a happy healthy Dog, it's a small price to pay." One of the highest rated dry dog foods on Amazon is Royal Canin Breed Health Nutrition, which claims to offer specific nutrition for pure breed dogs. Royal Canin recognizes that different dog breeds have different nutritional needs. based characteristics like their muzzle size and shape, size, body structure, skin, and coat. 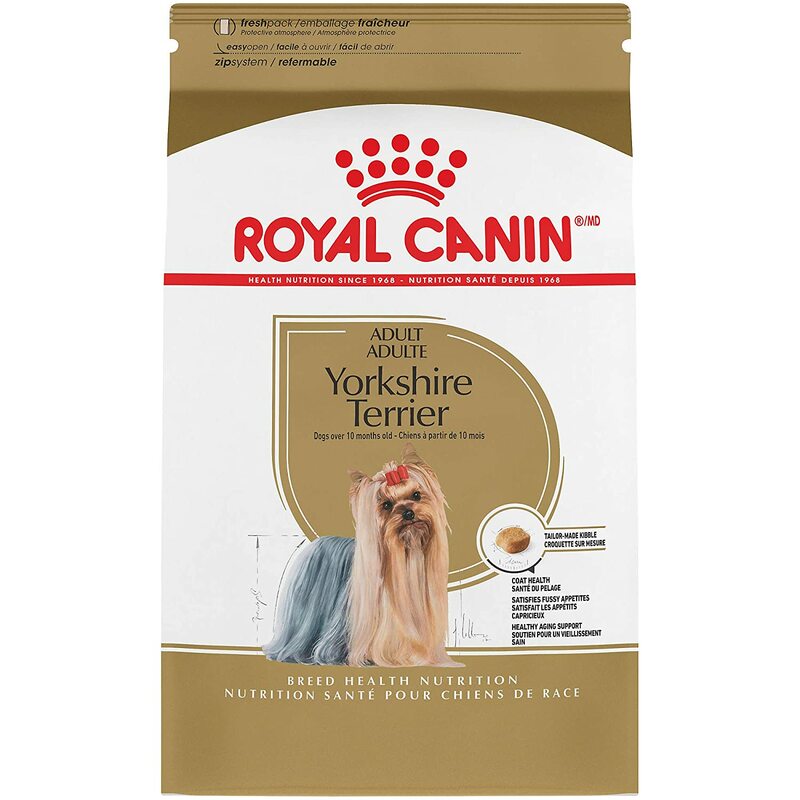 Their dog food for Yorkshire Terriers, comes in 2.5 and 10 pound bags, priced at $17.00 to $38.69, and features small kibble that is easy for yorkies to chew and Omega 3 and Omega 6 fatty acids to keep their coats soft and shiny. One satisfied yorkie parent raves, "My 10-year old Yorkie absolutely loves this stuff! He acts as if he is getting a steak dinner every day! 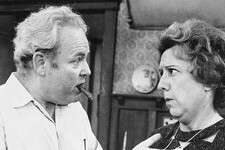 I used to have him on Iam's and that worked OK. But this Royal Canin is a premium dog food. I noticed an immediate difference in his energy level, mobility and his muscle tone. It seems to work well in his digestive system. He has about two bowel movements a day, and his stools are always solid, never runny. I couldn't be more pleased with this product!" 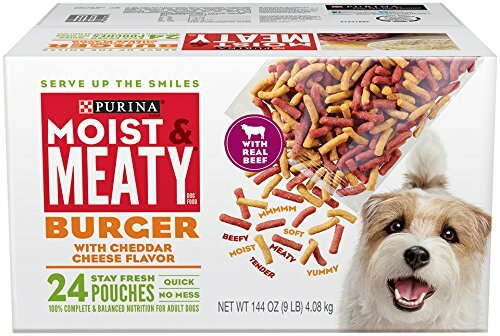 The best rated wet dog food on Amazon is Purina Moist and Meaty. At just $9.33 for 24 individual pouches to $13.69 for 36 individual packages, this food includes meat as its first ingredient, as well as balanced nutrition for your pup. One satisfied customer raves, "This pet food is perfect for my dogs, especially one who has issues with her teeth. I adopted her from a shelter and her teeth were in very bad shape so she now has quite a few missing teeth and hard food is just too difficult for her to eat. I love that the food is soft but not mushy and she really seems to enjoy eating it. I love that they are portioned perfectly for my three small dogs as well. This is the only food we buy now!" Here's another high-ranking food. 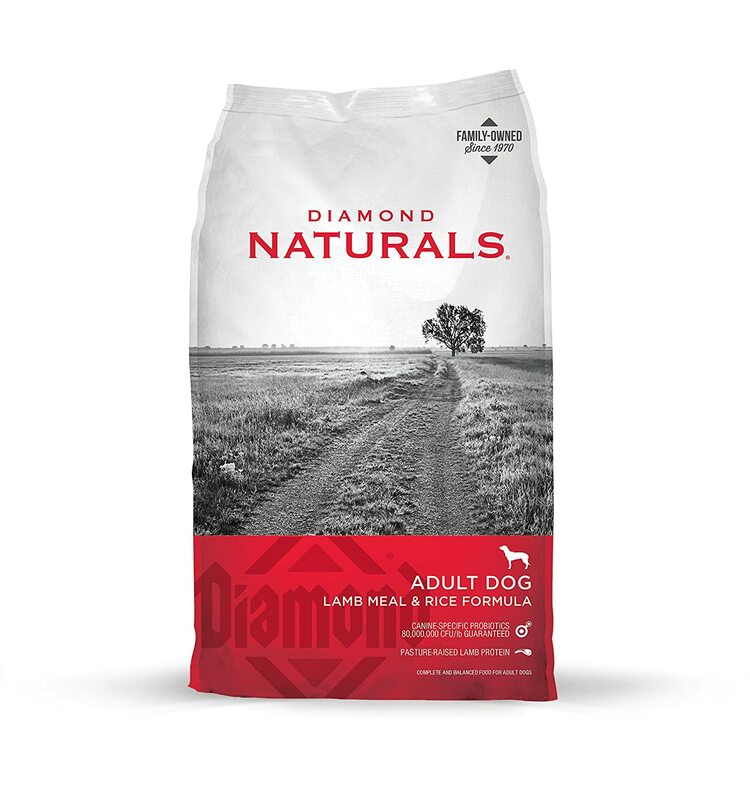 Amazon Verified Expert BestReviews ranked Diamond Naturals Adult Real Meat Recipe Premium Dry Dog Food as the "best value" in dog food, priced from $14.94 for six pounds to $36.99 for 40 pounds of dry dog food, it is affordable, but has similarities with high-end pet food brands. Diamond Naturals is made with pasture-raised lamb, fruits and vegetables, and probiotics, and includes no corn, wheat, or filler. 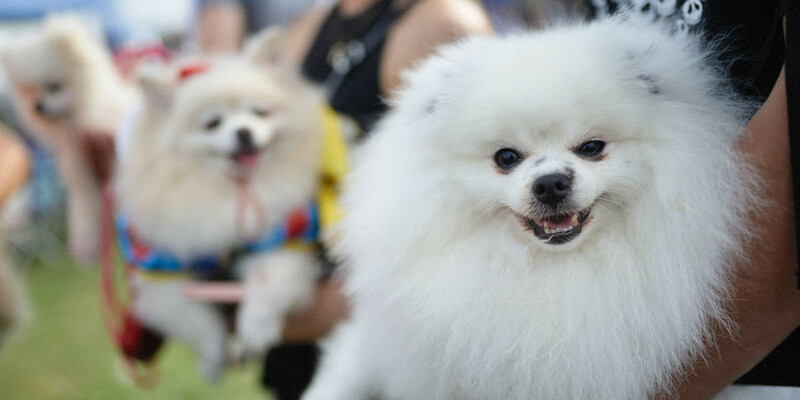 While BestReviews notes that this food does contain grains, which may upset some sensitive dogs' tummies, it includes meat as its main ingredient and is a popular choice among dogs and dog moms on a budget. 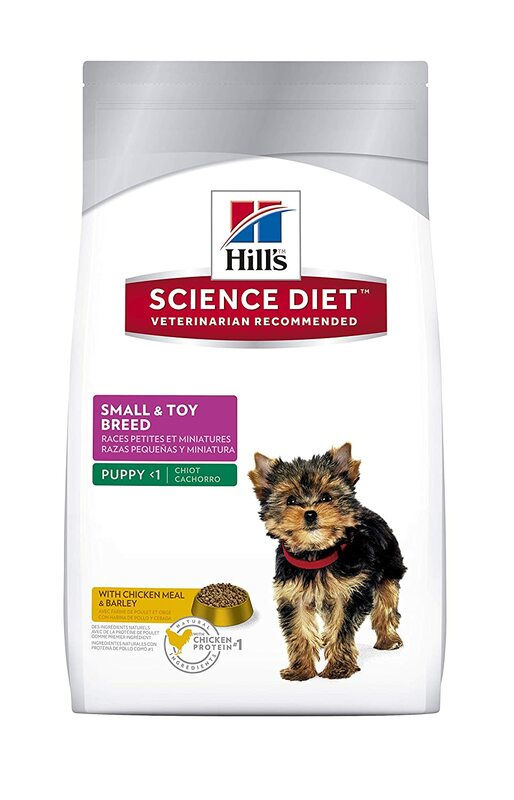 The highest-rated puppy food on Amazon is Hill's Science Diet Puppy Small & Toy Breed dry dog food. Specifically designed for small breed puppies, it's easy for small mouths to eat, and provides nutrients like DHA from fish oil, important for growing puppies' development, and antioxidants like vitamins C and E to support a healthy immune system. It ranges in price from $13.99 for a 4.5-pound bag to $30.99 for a 15.5-pound bag, making it an affordable choice for dog owners with small breed dogs up to 1 year old. It's no wonder it rates 4.7 stars out of five on Amazon, and includes over 1,400 five-star reviews, including this one, from a proud puppy foster parent: "I love science diet, its the only food I trust to feed my dogs. This puppy food is awesome for young small breeds. The size of the kibble is smaller then normal "small bites" which makes it so much easier for growing puppies to chew and prepare them for the normal small bite size when they get bigger. I foster for a chihuahua rescue and have had many puppies come and go at my house and this is my go to food for small breed puppies." which has been specially formulated to help them stay active and healthy as they grow. 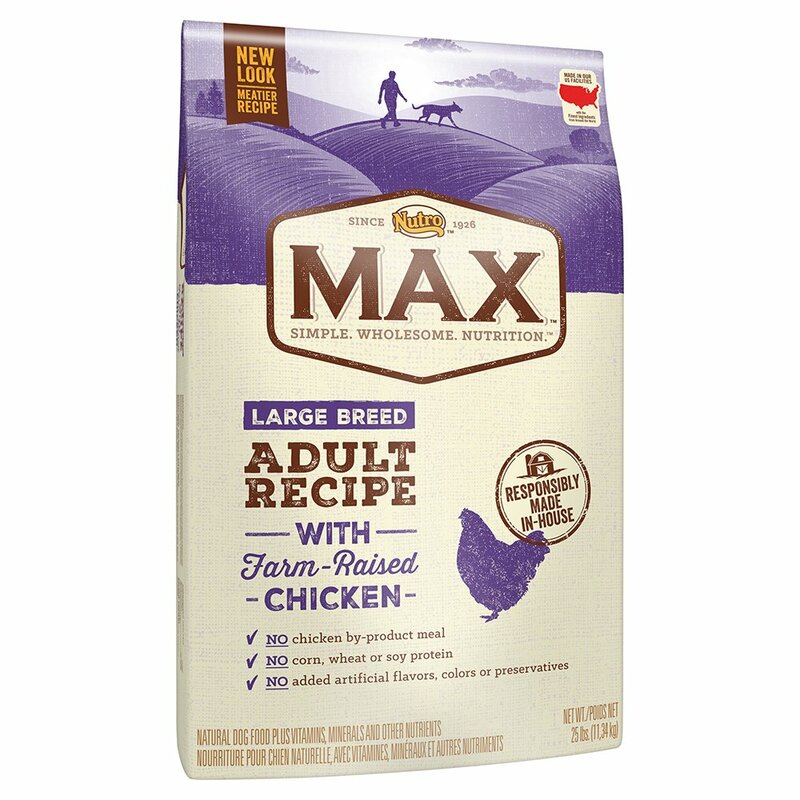 Priced at $32.99 for a 25 pound bag, their all-natural large-breed formula is made with farm-raised chicken, and whole grains and contains no artificial flavors or preservatives. As one satisfied dog mom remarked, "This food is the only food that works for my dog! She's got a bit of a sensitive stomach (she's a bernese mountain dog) and her vet almost made her go onto prescription food forever! Thank goodness this food ended up working for her instead." 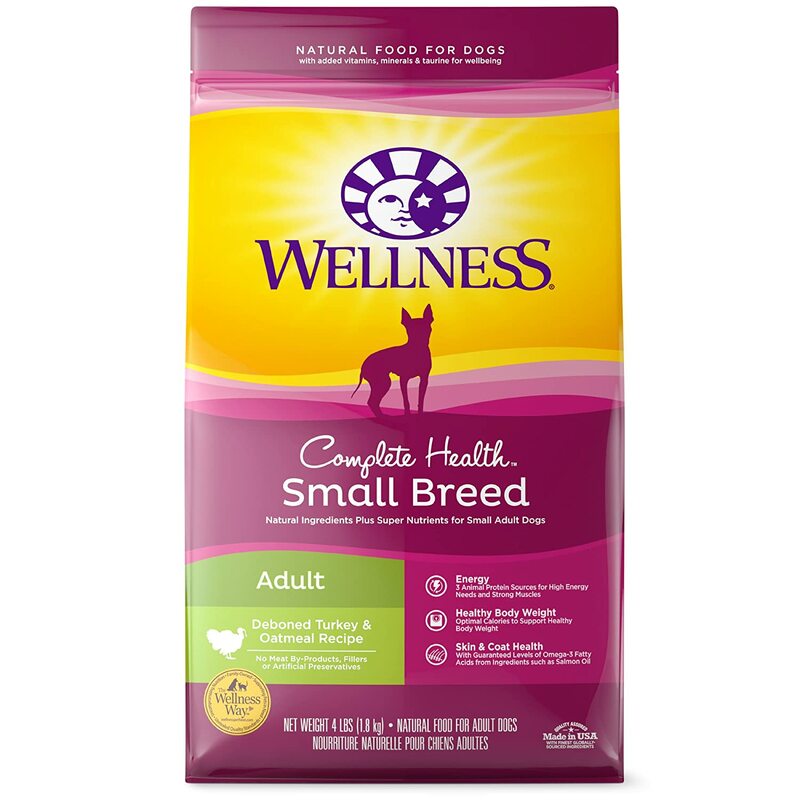 One of the highest-rated gluten-free dog foods available is Wellness Complete Health Natural Dry Small Breed Dog Food. 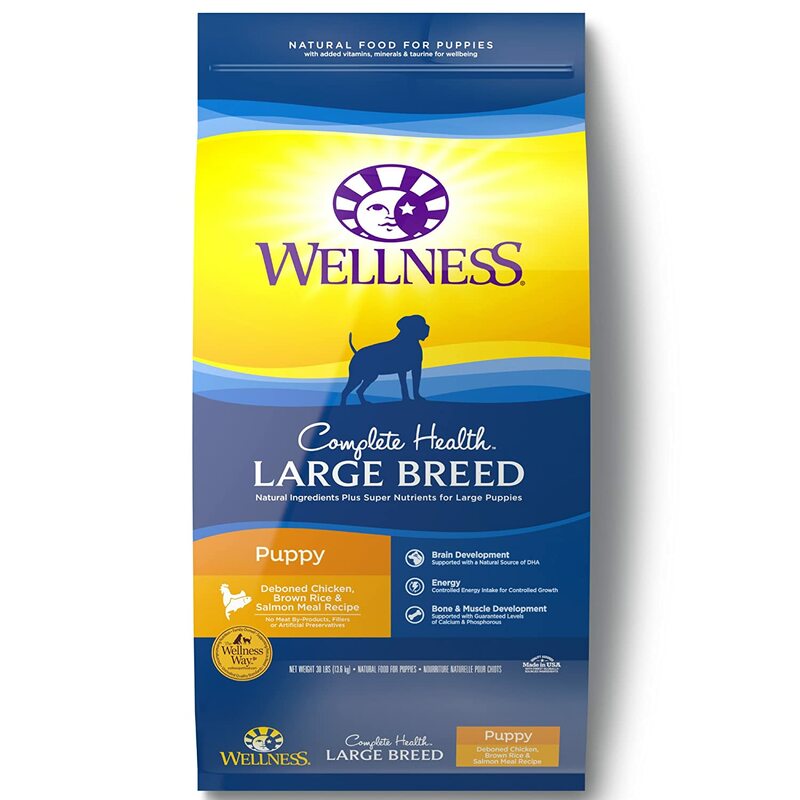 Priced at $15.19 for a 4-pound bag to $33.19 for a 12-pound bag, Wellness complete contains no wheat, corn, soy, meat by-products, making it a great choice for pups with food sensitivities. One five-star Amazon reviewer recommends, "I've tried many other brands for my Jack Russell mix and my Min Pin, both have different needs and food issues. My Jackie has allergy issues and my Minnie has a very sensitive tummy. They both are doing very well and their coats are shiny and thick. I highly recommend this product." 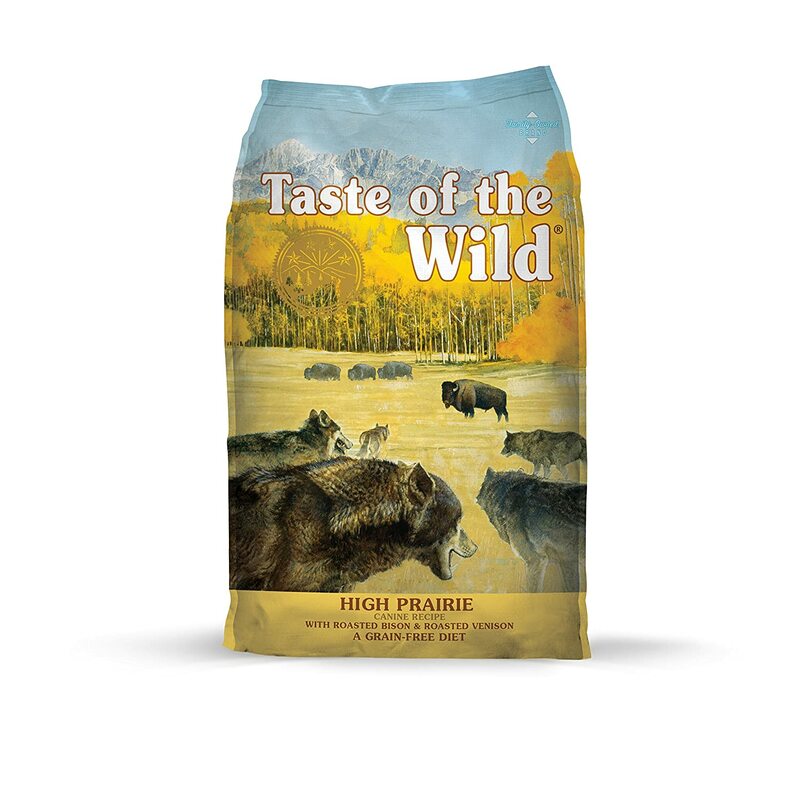 The best-selling dog food on Amazon is Taste Of The Wild Grain Free High Protein Dry Dog Food, priced at $28.99 for a 15-pound bag to $48.99 for a 30-pound bag. With high-end ingredients like roasted bison, probiotics, antioxidants, and omega fatty acids, it's easy to see why this popular, grain-free dog food has over 4,300 five-star reviews. One recent reviewer remarked, "Our Boxer and Chihuahua love this food! We were always buying low quality brands like Purina and Iams and they’d always eat so much of it without getting full due to the fillers. I did a ton of research and wanted the best deal as any good brand like this isn’t going to be cheap, but you get what you pay for. With this, they have one big bowl and are good for the day!" 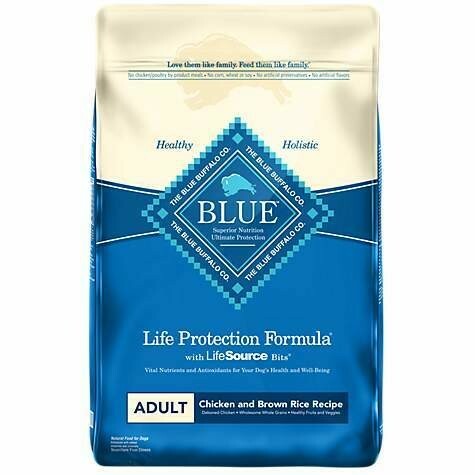 Another popular dry dog food is Blue Buffalo Life Protection Adult Dry Dog Food, which is priced from $15.77 for a 6-pound bag to $48.99 for a 30-pound bag. This mid-range natural option contains ingredients like chicken, brown rice, peas, cranberries, and sweet potatoes, which makes it sound more like dinner for dog moms, than food for their fur babies. It also includes essential nutrients like glucosamine hydrochloride, which can help your dog's joints stay healthy as their age. One picky dog and his mom love Blue Buffalo dog food: "My dog can be somewhat picky with food and I'm picky about the quality of her food. We noticed she wasn't eating what we had been buying her as quickly or fully as she used to so we got her a sample of this and she gobbled it right up. We made the switch and she's one happy puppy!" 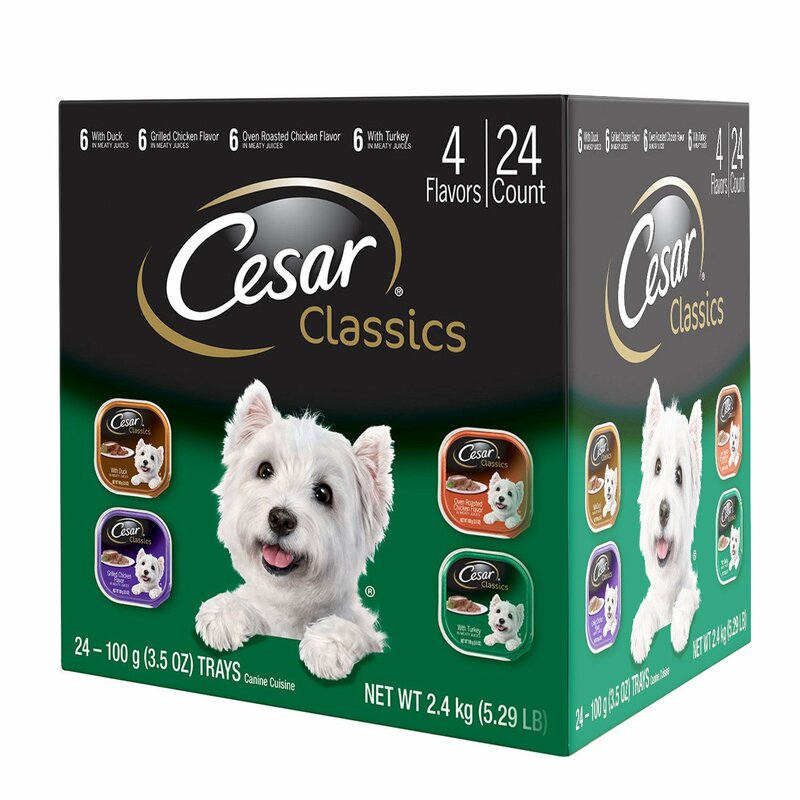 Another top-rated wet food available on Amazon is Cesar Gourmet Wet Dog Food, priced at $16.79 for 24 single-serving trays, which are perfect for small-breed dogs. Each variety pack includes multiple flavors, like their poultry variety pack with duck, grilled chicken, oven-roasted chicken, and turkey flavors, and steak-lovers, which includes classics filet mignon and porterhouse steak, savory delights filet mignon, and filets in sauce prime rib flavors. One satisfied five-star reviewer remarked, "My guy is getting older and losing his teeth, he loves all of the flavors and varieties Cesar's food comes in and he can chew it much more easily than dry food." 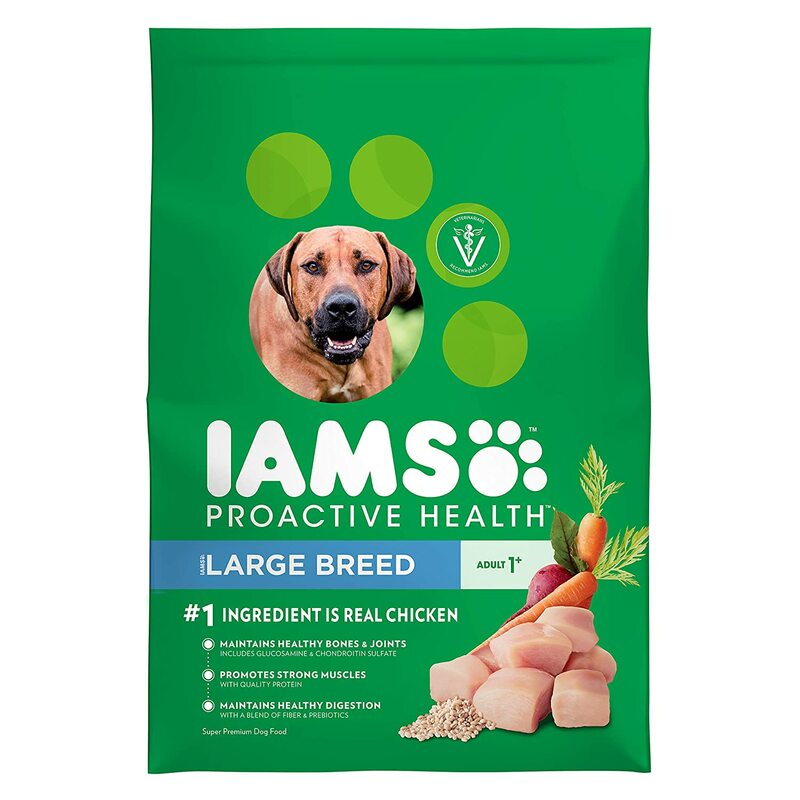 Another highly rated dry dog food on Amazon is IAMS ProActive Health Adult Dog Food for Large Dogs. Their food is moderately priced at $17.94 for a 15-pound bag to $38.99 for a 40-pound bag, and includes ingredients like chicken to support a healthy immune system, bones, joints, coat, and metabolism. One K-9 officer loved this food for his professional dogs, "I was a professional police K9 handler for 14 years. This is all I ever feed my dogs. 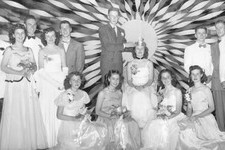 It kept them healthy, strong and fit." The Amazon Brand Solimo has a new ultra premium dry dog food available, at the reasonable price of $11.99 for a five-pound trial bag to $39.99 for 30 pounds of kibble. It comes in flavors like beef, chicken, and whitefish, each with promising of high-quality proteins, and no grains, which makes them perfect for sensitive tummies. So far reviewers love that it is grain-free, and their dogs seem to love it, too, which is definitely a plus. As one reviewer wrote, "What I love is what is not in this food. Love the no grain for my sensitive pet, and my neighbor's dog sneaks over to my house to eat it. Solimo is a brand that is proving to be great in every aspect." 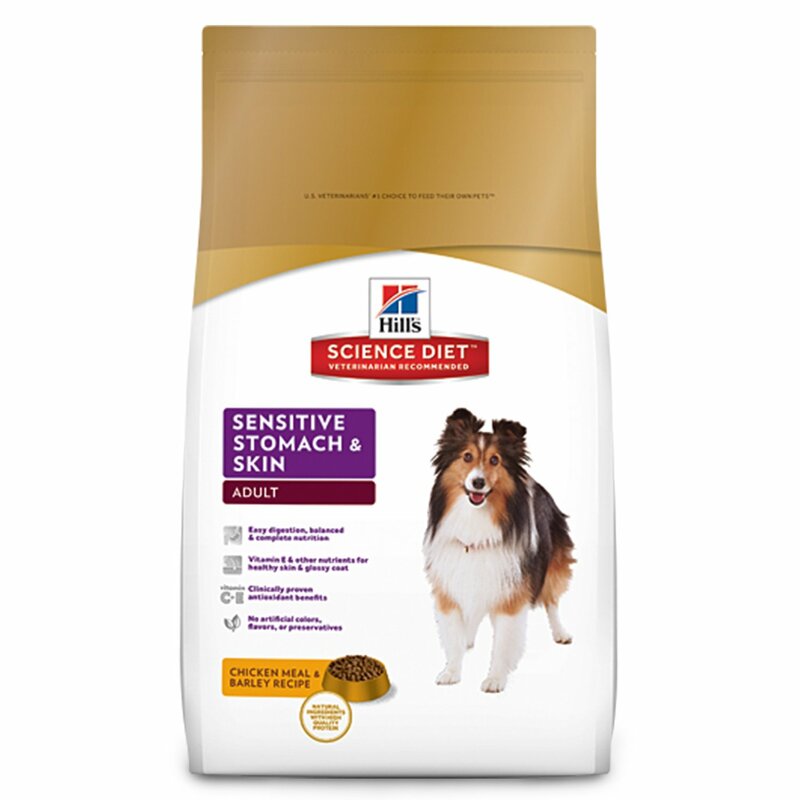 For dogs with sensitive tummies or skin, Hill's Science Diet Adult Sensitive Stomach & Skin Dog Food might be a great option to try. It's formulated for adult dogs with food sensitivities, which can manifest as itchy skin rashes. Priced at $13.99 for a four-pound bag, to $52.99 for 30-pound bag, if you buy from Amazon, they offer a money-back guarantee, making it totally worth a try for dog parents with picky pooches. One recent reviewer called this food, "the best dry food out there," adding, "I have a Doberman with seriously sensitive skin. I won’t buy any other brand after trying her on this. She stays fuller longer, poops less, and her dry coat and itching problems have gone away. My whole family switched their dogs over, and couldn’t be happier with the results." A high-end option that dogs (and their dog moms) love is Fromm Four Star Nutritionals. Their dry foods are grain, poultry and potato free, include ingredients like hand-selected cuts of meat, cheese, olive oil, and fresh produce, which make them sound pretty amazing, and important additions like prebiotics (fiber) and probiotics (helpful bacteria), for gut health, and omega fatty acids for their skin and coat. At $27.42 for a four-pound bag, it is one of more expensive dry dog foods on the market, but it's earned a 4.5-star rating from the Dog Food Advisor website, which analyzes food nutrition labels and online reviews to select the best choices for your dog. If Amazon reviews are any indication, dogs love it. One yorkie mommy had only great things to say: "Feeding my yorkies good food is important to me and they love it. No tummy issues or loose stools ever. 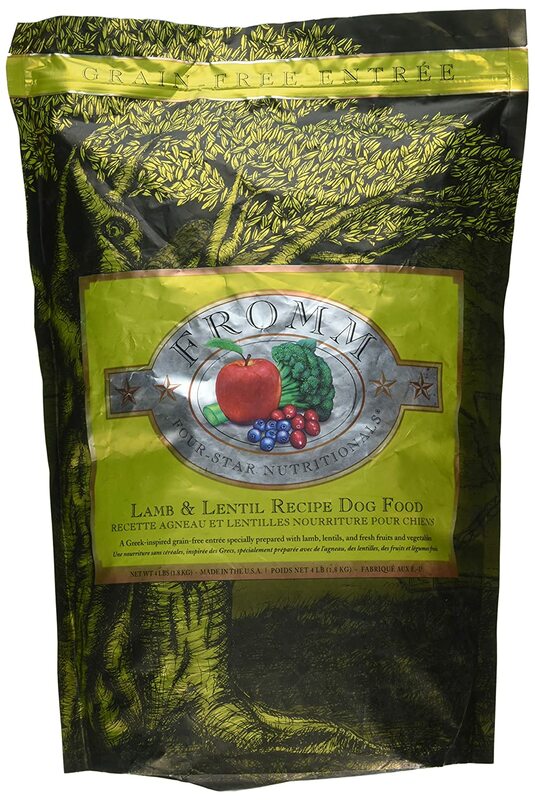 Very balanced nutrition and I have high regard for the Fromm Company compared to other dog food companies. I trust that the products they make to be quality." 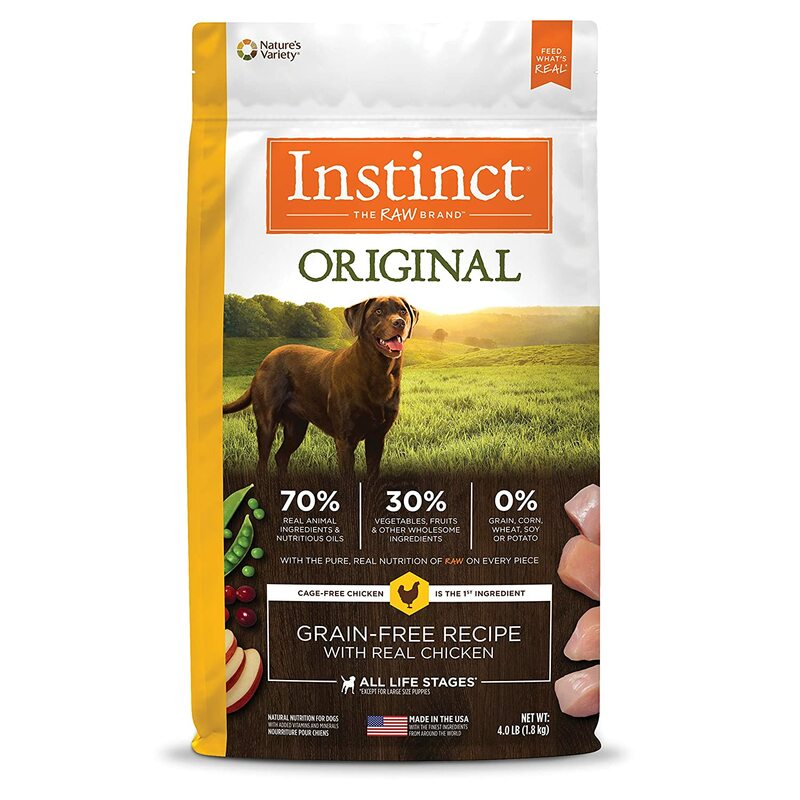 Priced from $19.99 for a 4-pound bag to $59.99 for a 22.5-pound bag, Instinct Original Dry Dog Food receives a five-star ranking from the website Dog Food Advisor, and makes their list of best dry dog foods, based on nutritional content. They like that it has above average protein and fat content, and no anonymous meat ingredients. For an in-depth analysis of the nutrition in this popular dry dog food, check out their page. One satisfied customer had this to say: "We have faithfully purchased Instinct for 7 years, and my dog loves it! In fact, she loves the new formula even better... we have some of the old recipe left and now she won't eat it. She only wants the new one. She has had no stomach or diarrhea issues with the new recipe. Smooth transition and we are very happy. Will buy the big bag next time!" 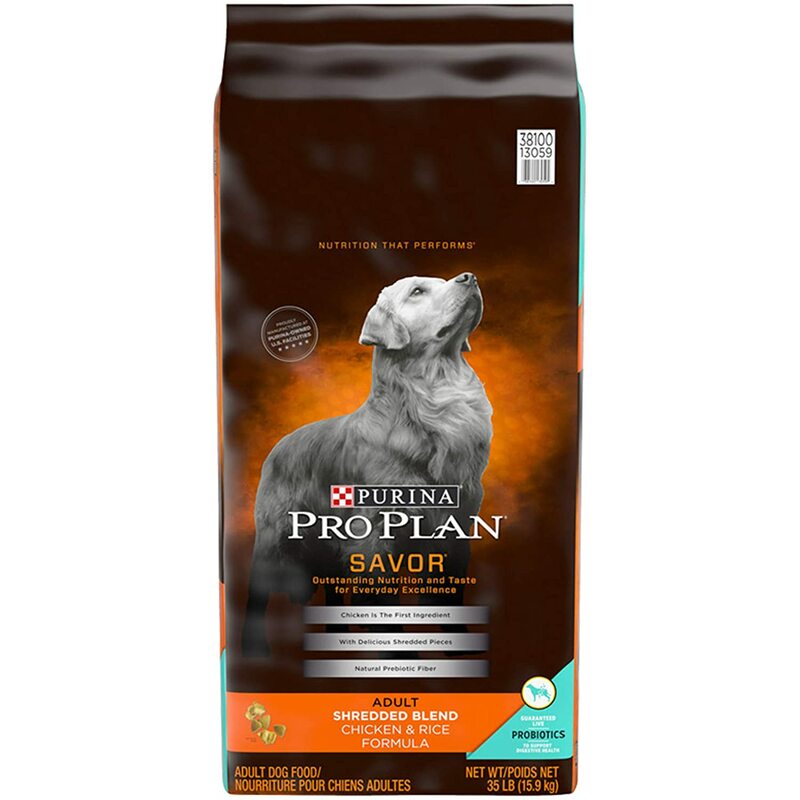 Purina has long been a brand pet owners trust, and Purina Pro Plan Savor Shredded Blend Chicken & Rice Formula is meat-based option that is nutritionally-balanced, easy to eat and digest, and has a mix of hard and soft kibble that's easy on dog's teeth. It ranked on Amazon Verified Expert BestReviews list of top five dog foods, and has a 4.3 star rating on Amazon, with over 900 reviews. Priced from $39.98 for a 35-pound bag, this dog food is also an affordable option for dog owners looking for a meat-based food to feed their pooch. One recent customer notes, "We have been feeding this food to our dogs for about 10 years. It was recommended by our vet when we found out our lab couldn't tolerate beef. All of our dogs seem to enjoy this food. We have several different breeds of dogs, including a husky and a terrier mix, so it's versatile between the different breeds and sizes. It has two textures. One is the traditional harder pellets and the other is a more natural shaped (slightly softer) piece. Our cat would eat this if we let him!" 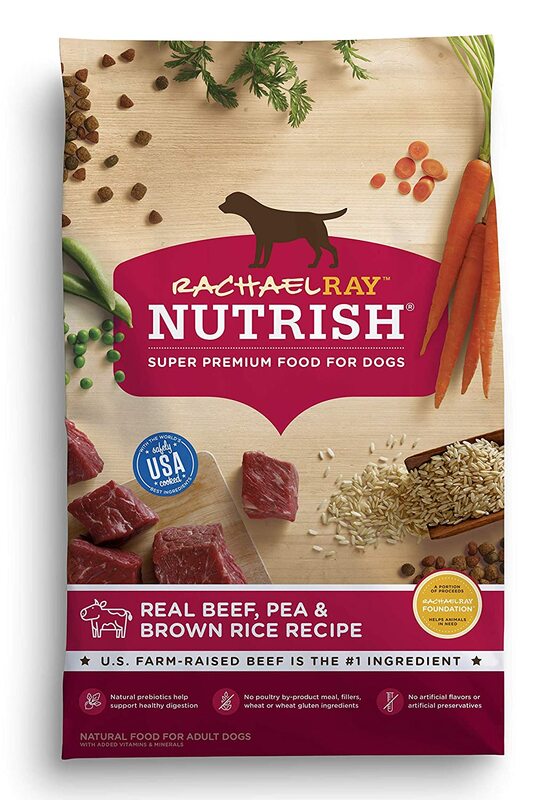 A highly-rated dry dog food from a trusted-name in the culinary world is Rachael Ray Nutrish Natural Dry Dog Food. 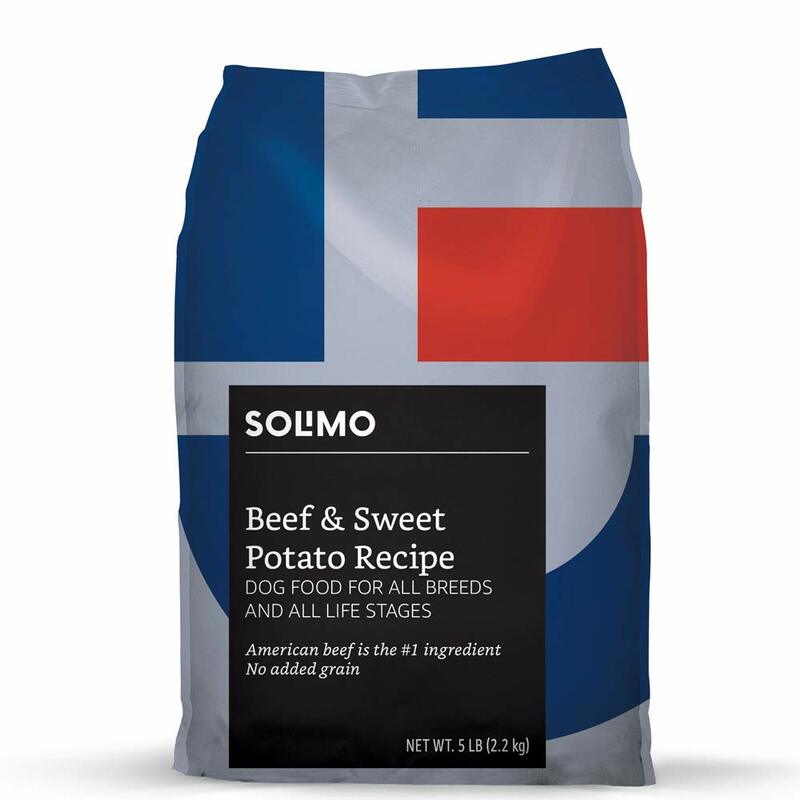 It contains, farm-raised Beef as it's number one ingredient, prebiotics, and no fillers or wheat gluten ingredients. The price tag of just $38.99 for a 40 pound bag of dry food, makes this one of the most affordable options on our list. One five-star reviewer writes, "We have been buying this food for years! When Rachael Ray came out with this food, we switched and our dogs all loved it and their coats improved. We have tried beef and chicken. The dogs seem to prefer the beef. This brand has not been on the recall lists as far as I know, which adds some comfort in knowing we are feeding quality food to our dogs!" Large breed puppies have special nutritional needs, says Pet Food Advisor. Because they grow seriously fast, it's important to not free-feed your big breed puppy, and pick a food that has the right balance of nutrition and an appropriate amount of calcium for their bone health like Wellness Complete Health Natural Dry Large Breed Puppy Food. They like that Wellness Core is a grain-free, meat-based dry dog food, with high quality ingredients like chicken as its main source of animal protein, earning it a five-star rating on their site. Amazon customers agree, like this reviewer, who writes, "I recently got a Golden Retriever pup. Sascha is almost 5 months, so I wanted to ensure I provided higher quality food, but also for a puppy. She loves it and I have had no issues at all in last month. Started with smaller bag to test out and after it was finished, ordered the 30lb bag as is a better deal and would require less frequent ordering. Feed your animals quality ingredients! They are like our children and we want them to live long, healthy lives! Aging dogs need special nutrition to stay healthy and strong as they slow down. 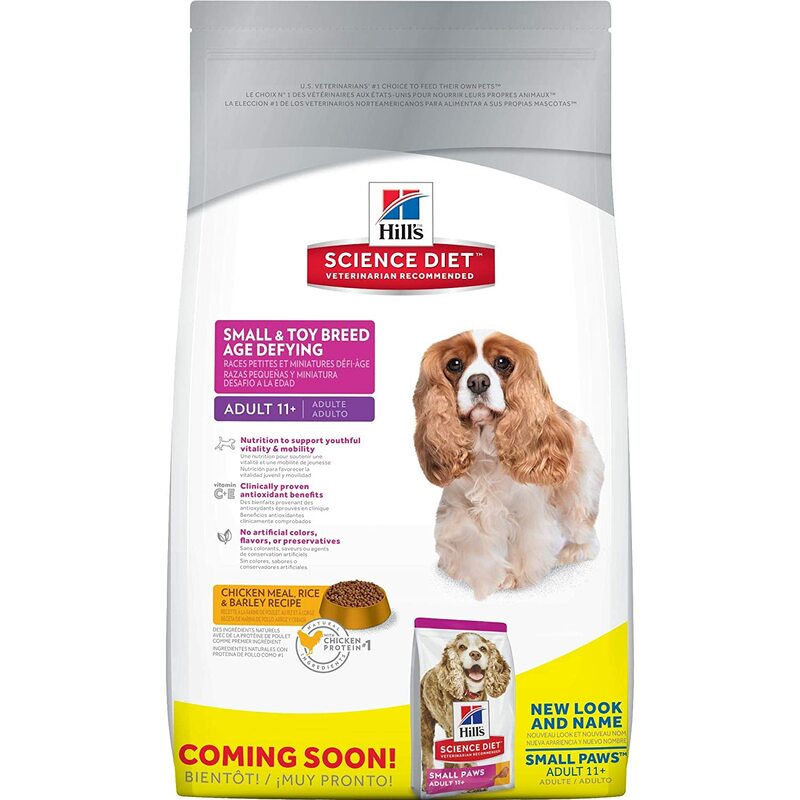 The best-rated senior dog food on Amazon is Hill's Science Diet Adult 11+ Small & Toy Breed Age Defying formula for dogs 11+ year's old and weighing less than 25 pounds. It's specially formulated to be easy to digest and support immune system health to keep your senior dog feeling young for years to come. Priced at $13.99 for a 4.5-pound bag to $30.99 for a 15.5-pound bag, this food is also an affordable option for dog-owners on a budget. As one five-star reviewer writes, "My lab had chronic kidney disease and this product was the best product after a lot of research to be the best without needing a prescription. It has low levels of phosphorus and it was easy for her to digest. This product helped her maintain a healthy life for an additional 4 years after her diagnoses. Great product!"